Blue-chip measure drops to levels not seen since 1997 as AIG reports biggest quarterly loss in corporate history, government revamps rescue. NEW YORK (CNNMoney.com) -- Stocks tumbled Monday, with the Dow and S&P 500 falling to 12-year lows after insurance company American International Group's huge quarterly loss added to worries about the financial sector and the economy. The Dow Jones industrial average (INDU) lost almost 300 points, or 4.2% to end at 6763.29, its lowest point since April 25, 1997. The S&P 500 (SPX) index lost 34 points, or 4.7%, ending at 700.82, its lowest close since Oct. 28, 1996. The Nasdaq composite (COMP) lost 55 points, or 4% to end at 1322.85. The tech-fueled Nasdaq has held up better than the other major averages this year and remains above its close of 1316.12 from Nov. 20, 2008. The stock losses Monday were in response to AIG, but also a continuation of the worries about the financial sector and the economy, said Bill Stone, chief investment strategist at PNC Financial Services. "There are reverberations from AIG and also the continued uncertainty around the financial sector as a whole, which is the chorus that never ends," he said. "That's paired with the second chorus that never ends - the weakness of the global economy," he said. "It's reflected in the weakness in the industrial, material and energy stocks today." Investors also remain wary about the various government initiatives to try to stem the recession, announced over the last few weeks, said Mark Travis, president and CEO at Intrepid Capital Funds. They include the newest bank bailout plan, the $787 billion economic stimulus plan and the $75 billion mortgage modification plan. "The administration is hemming and hawing and still not being clear about exactly what they are going to do and how it's going to work," he said. Travis said that some of the policies are "well meaning but aren't going to provide the elixir that they hope." With all the uncertainty, investors are on a "capital strike." Tuesday brings an economic report on the housing industry and a number of Congressional hearings. 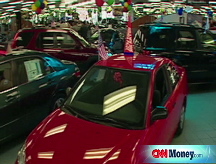 February sales from the nation's automakers are also due throughout the session. The National Association of Realtors releases its pending home sales index for January in the morning. The index is expected to have fallen 3% after rising 6.3% in the previous month. Federal Reserve Chairman Ben Bernanke is due to testify before the Senate Budget Committee on economic and budget challenges, starting at 10 a.m. ET. Also at 10:00 a.m., Peter Orszag, director of the White House Office of Management and Budget, testifies before the House Budget Committee about the fiscal 2010 budget. AIG: AIG reported a $62 billion fourth-quarter loss, the largest in U.S. corporate history, on turmoil in the credit markets and massive restructuring costs. 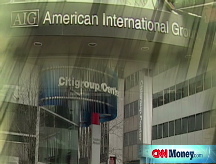 For the full year, AIG lost $99 billion after reporting a profit of $9.3 billion in 2007. Stocks tumbled Friday after the government said it will control as much as 36% of Citigroup's common stock. 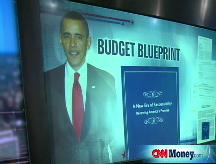 Also in play: a report showing the economy shrank at its sharpest pace in 26 years in the fourth quarter of 2008. Buffett: Adding to the weakness was billionaire investor Warren Buffett's annual chairman's letter, in which he talked about the tough 2008 his Berkshire Hathaway company experienced. The influential investor admitted that he "did some dumb things in investments" during the year. Stock movers: AIG dragged on other financial stocks, including Bank of America (BAC, Fortune 500), Wells Fargo (WFC, Fortune 500), Morgan Stanley (MS, Fortune 500), Goldman Sachs (GS, Fortune 500) and JPMorgan Chase (JPM, Fortune 500). The KBW Bank (BKX) sector index lost 6.4%. General Electric (GE, Fortune 500) slumped another 11% after saying Friday it is cutting its dividend by 68% to 10 cents per share from 31 cents. Market breadth was negative. On the New York Stock Exchange, losers beat winners by nearly 16 to one on volume of 1.98 billion shares. On the Nasdaq, decliners topped advancers by over 7 to one on volume of 2.36 billion shares. Economy: The Institute for Supply Management's manufacturing index rose modestly to 35.8 in February from 35.6 in January, after 12 months of declines. Economists expected a drop to 34, according to a Briefing.com survey. Despite the advance, the sector remains in a period of contraction, with any reading under 50 indicating weakness. Another report showed that construction spending fell 3.3% in January after falling 2.4% in December. Economists thought it would fall 1.5%. Another government report showed personal income rose 0.4% in January after falling 0.2% in December. Economists thought it would fall 0.2%. Personal Spending rose 0.6% in January after falling 1% in December. Economists thought it would rise 0.4%. Bonds: Treasury prices rallied, lowering the yield on the benchmark 10-year note to 2.87% from Friday's 3.01%. Treasury prices and yields move in opposite directions. Other markets: In global trading, Asian and European markets ended lower. U.S. light crude oil for April delivery fell $4.61 to settle at $40.15 a barrel on the New York Mercantile Exchange. COMEX gold for April delivery fell $2.50 to settle at $940 an ounce. Talkback: Are you living on your unemployment check? How are you making ends meet? What bills are you paying - and which ones are sliding? E-mail your story to realstories@cnnmoney.com and you could be part of an upcoming article.